Process coconut, walnuts, almonds, pumpkin seeds and flaxseed meal together in a blender or food processor until finely ground and blade starts to seize. Add, seed mixture, water and honey to a small saucepan and heat over medium-low heat stirring constantly for 4-5 minutes, until it almost simmers. Let sit for 3-5 minutes to thicken. Apple-Cinnamon Porridge: Stir in some finely diced apple and ½ tsp ground cinnamon. 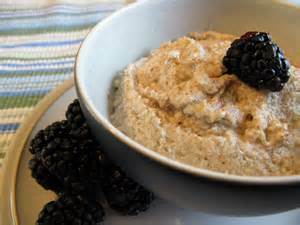 Maple-Nut Porridge: Use 1 Tbsp real maple syrup, instead of honey and sprinkle 2 Tbsp chopped pecans over the top. Banana-Nut Porridge: Omit honey and mash in half of a ripe banana. Sprinkle 2 Tbsp chopped pecans over the top. Pumpkin Pie Porridge: Stir in ¼ cup pumpkin puree and 1/8 tsp (a good pinch) each of ground cinnamon, ginger, nutmeg, allspice and cloves. Butter and Salt Porridge: Stir in ½ tsp sea salt (or to taste) and let 1 Tbsp unsalted butter melt over the top. Chocolate Porridge: Stir in 1 Tbsp cocoa power.